Usually the internet works plug & play. If your Computer shows that there is a network cable plugged in but you still don’t have an internet connection please check your network configuration. The IP Address must be obtained automatically in the Dormitories. The easiest way to get to the network preferences is by pressing the windows button + R at the same time and afterwards type ncpa.cpl and press OK. There will be shown several network adapters. Now we identify the Ethernet Adapter and mark it with a right click and chose properties in the menu. We now open TCP/IPv4 with a double click and set both Options to obtain automatically. 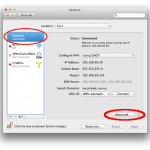 You get there by opening the system preferences and chose network. On the left side you see a list of your network adapters. You identify the Ethernet adapter and open it. 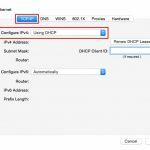 Set your IPv4 configuration to DHCP and press apply.